As much as I want to start this new year off with a fresh start for Fresh Fitted Friday, I just can't help wanting to do a continuation of last week's theme so I decided this week's hat needs to be the Lehigh Valley IronPigs home cap. 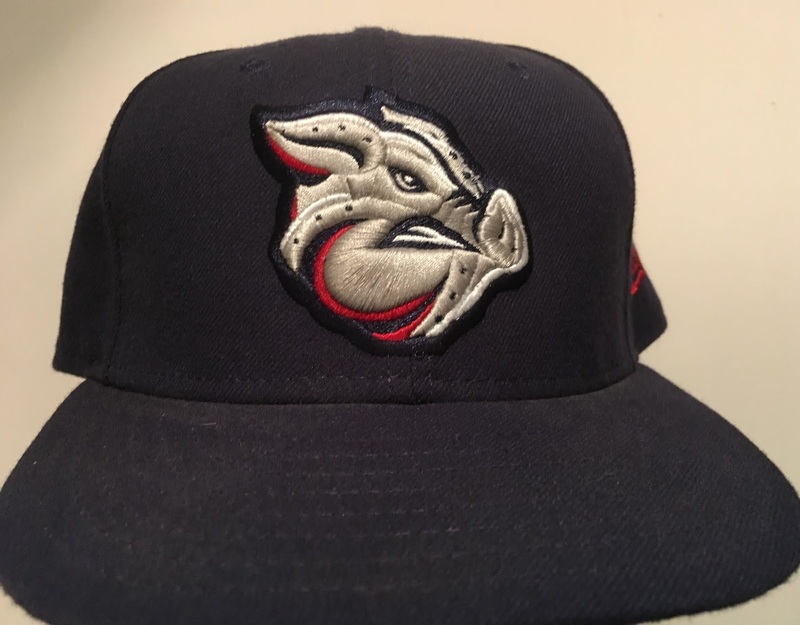 Brandiose designed this cap which the IronPigs have worn for most of their home games since their inaugural season in 2008. I love the 3D embroidery on the crown and that the fierce looking pig has become a touchstone in terms of design elements for Brandiose. Because the logo and sweatband tags haven't varied much in the time since this cap first came out, it's almost impossible to decipher which year this cap was purchased although it was Made In U.S.A so it's likely not that recent. I appreciate you coming to the site to read about this now-iconic cap logo and I hope you return next week as I have another fun cap from the IronPigs cap artillery that I'm looking forward to sharing with you. Even though I'm not a big fan of Philadelphia sports teams, I have an affinity for the city and would gladly wear this cap around if it wasn't a size 7 1/8, which is too small for me. I'll be putting it on the Trading Block so please don't hesitate to reach out if you want this or any other cap from that list and you are willing to part with any of the hats on my Wish List.